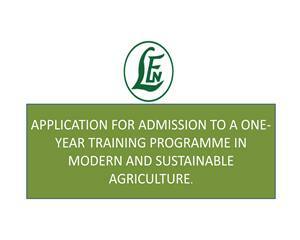 Application for Admission to One-Year Free Training Program in Modern and Sustainable Agriculture is currently on-going. The Foundation has been running agricultural training for youths and farmers since 1987 and currently has six schools in the different agro-ecological zones of Nigeria. The schools located in the FCT, Osun, Ondo, Kaduna, Kano and Gombe states are co-financed by Leventis Foundation and the respective State Governments. All the Schools offer training to young people (male and female) desirous of making a career in farming. The comprehensive one-year training exposes the participants to several areas of agriculture and other farm businesses. Note: The application for 2019 training has not commenced yet. We will update you when it starts.